Welcome to my little slice of the internet where I like to encourage optimal health by seeking it in my life and sharing my discoveries with you. That pretty thought translates into “You get to learn from my mistakes which I freely share here!” Ha! Recently, I reintroduced insulin into my health regimen, and I thought it might be interesting to share what I’ve learned about AIP + insulin + Type 1 Diabetes. Let’s take a look! Does Insulin Mean Free Reign of the Kitchen? Ha, I only took my crazy freedom so far! Gluten, dairy, and eggs I knew should be off limits, but carbs? I could eat anything I wanted carb-wise now, right?? Crackers at every meal was not an exaggeration. That’s what I did for about a week… and then the scale told me I gained 10 pounds. 10! In one week! While insulin does make you gain weight, that was a bit excessive. I needed to reign things in and restore order to my diet. Less processed food more vegetables! Ok, so I’ve recommitted myself to my version of the Autoimmune Protocol which means I watch my carb intake along with the guidelines for inflammatory foods of AIP. I went back to my high vegetable and meat plus light fruit diet and almost instantly 4 pounds fell off, in like 2 days. With my food intake normalized back to how I had been eating for the 19 months prior to introducing insulin, the strangest thing happened. You’ll never guess so I’ll just tell you. My insulin need dropped, slowly but steadily. My insulin dosage was as high as 14 units of long acting insulin (taken once per day) plus 7-8 units of fast acting (spread over 3 meals based on carbohydrates consumed at each meal). First I started noticing I went low after a meal, so I cut back systematically on fast-acting insulin until my carb/insulin ratio was 30/1. At that point, I discontinued my injections of fast acting insulin completely as all my meals are 30 carbs or less. Then, something even more crazy happened…I went low after meals with only the long acting insulin in my system! Ok, going low is not good, and I was always able to catch it before I hit 60, so maybe that’s not technically a “low”, but my blood sugar was headed down, I could feel it (and test it!). I am currently taking 9 units of long acting insulin one time a day. That’s it. Zero fast acting insulin with meals. One injection versus 4 per day? Yes, please! I’m definitely still willing to change my diet for that! Even with only 1.5 months of insulin under my belt, I have been able to see how the Autoimmune Protocol can still identify food sensitivities even with insulin to help my blood sugar levels. As you may have seen, I have successfully reintroduced cashews since beginning insulin. Woot! On the flip side, I also had a dairy cross-contamination that raised my morning blood sugar to the 170’s the day after I was exposed. My fasting blood sugar still works as an indicator of a food sensitivity even though I’m on insulin! While I’m not thrilled I was cross-contaminated, it was a good test to see if AIP would still work now that I’m on insulin. The duration of high blood sugar was a tad shorter, 5 days as opposed to 7, so maybe that’s where extra insulin helps. Perhaps healing is faster with additional insulin on board? Tightening down my carbs and sticking with the AIP diet plus introductions has definitely increased my insulin sensitivity. Yes, there are less carbs in my diet but my body responds better to less insulin. Increasing insulin sensitivity is a good thing! Fewer and smaller insulin injections for me! 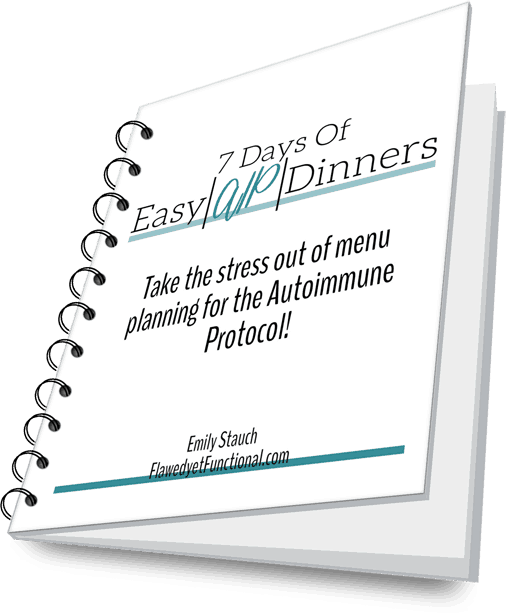 A while back, I mentioned one of my goals was to see if the Autoimmune Protocol would result in more stable blood sugar. Oh my friends, it does! While taking only long acting insulin, I am experiencing just as stable blood sugar as I was before introducing insulin. Just as I noticed when I first started the AIP elimination phase, I have so much energy and feel great when I eat right. I sleep soundly, wake up rested, and have energy to move all day long. Do you want these things too? You can! It is hard work to change your diet, but it is worth it. You don’t have to be a diabetic to feel the positive results of eating whole foods. Overall, I’m blown away by how this diet continues to work even after introducing insulin. Not only do I feel great and continue to manage my diabetes well, I can continue to figure out what foods work best in my body which I know will have huge positive health impacts for the rest of my life. AIP + insulin + Type 1 Diabetes is a winning combination for Type 1 Diabetics looking for optimal health.